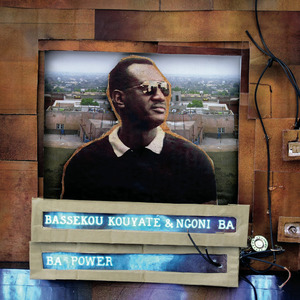 If you’ve seen Mali’s Bassekou Kouyate & Ngoni Ba in concert (they’ve toured the USA extensively and have played in Richmond twice), you know they’re one of the most powerful, electric bands on any continent. Now they’ve made an album that captures the power of their live shows. Their fourth album is produced by Glitterbeat founder Chris Eckman, a rock musician in his own right (The Walkabouts) as well as an Afro-rock enthusiast; he helped Tamikrest achieve a new level of crackling intensity on 2013’s Chatma, and he’s done the same for Ngoni Ba here. Almost all the energy here is calabash-generated: the four ngoni, two percussionist lineup is augmented by trap drummer Dave Smith (of Robert Plant’s band) on four tracks and trumpeter Jon Hassell (Brian Eno) on one. The ngonis are pickup-miked and Bassekou routes his through a blizzard of effects; “the Hendrix of the [instrument name here]” tag is a cliché, but for once it’s apt. The album is short, sweet and to the point: start with track 1, certainly the most intense song Kouyate has yet waxed, it’s a blast of Malian punk rock. 2, 5 and especially 6 are close behind in intensity. Don’t miss this one.